Right now it seems like I am experiencing the waiting and anticipation much like I am at the end of my pregnancies. It feels as if the random contractions of life aren't doing much and I am wondering when, or if, "labor day" will come and when/if we will be delivered from the waiting and wondering stage we are in right now. 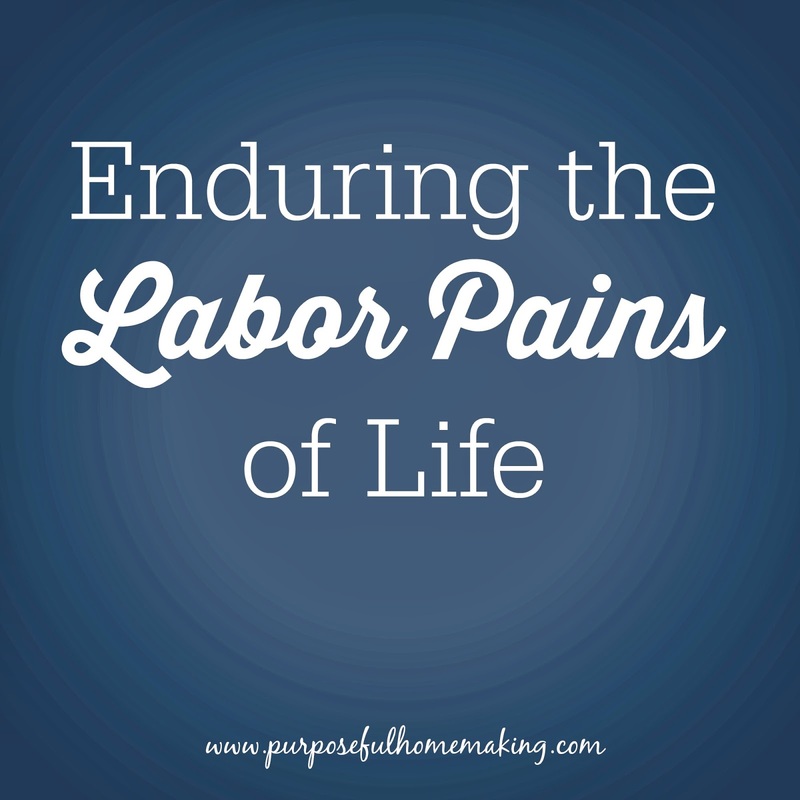 Sometimes in the labor pains of life, the hardest part is right before the delivery. Delivery from the waiting. Delivery from the pain. Delivery from the unknown. It's at this point we are most tempted to quit. We don't feel like praying about the situation anymore. We don't want to wait on God anymore. We just want to get "this" over with. Personally, I'm tempted to complain about the contractions of life that are squeezing me and pressing me in. I want to say "I'm done!" I want to get past the hard part and enjoy the new life experiences. Do you ever find yourself in situations in life like that? I am there. Right now. Back in the fall, a house became available that we feel would meet the needs of our growing, homeschooling family. The house will need a lot of work to get it ready for our us, but we feel the payoff will be worth it. The house is near our present location so we will still be close to all of our current stores, doctors, church and even neighbors. It's also next door to my parents which would be a blessing to have family right next door. The only problem is, we have to sell our house first. We packed up about 1/4 to 1/3 of our stuff and put it in storage so that the house would "show" better. That means all of the kids' dress up stuff, train tracks, school desks, many toys, seasonal clothes, most of our art/craft supplies, books, pictures and anything considered a luxury is gone for now. My husband and I strongly sense that the Lord does want our house on the market, but of course, we don't know exactly what He has planned for us. I have no idea what God is ultimately going to do in regards to our house. What I do know is, He has not left me alone as I wrestle through this. And honestly, I will be fine if we don't move and I'll (eventually...after all the crazy amount of work) be fine if we do move. It's the waiting while a lot of our stuff is packed up that is hard. It's the "Hurry and clean the house up kids. We have a showing! (Oh, and yes, the showing is during lunch and naptime.) That's the hard part. Just the other day, my six year old daughter was crying because she couldn't have something she wanted that was packed up. I encouraged her to go pour her heart out to Jesus about it. Romans 8:26 "And the Holy Spirit helps us in our weakness. For example, we don’t know what God wants us to pray for. But the Holy Spirit prays for us with groanings that cannot be expressed in words." While this is certainly not the worst trial to be going through by any means, it is still difficult at times. I also know that God has shown me how incredibly blessed I am. The reason the house is getting so small is because of the six people God has placed together as a family inside these walls. I couldn't ask for a better problem! I'm also reminded that people all over the world would love to have a house my size (approximately 1,100 square feet) OR that they would love to have four children to call their own. I am also learning to daily put my eyes on Jesus. I am not to look at the circumstances around me and feel out of control. I am not to let the contractions of life squeeze me without allowing them to make progress in my spiritual walk with Christ. James 1:2 "Dear brothers and sisters, when troubles come your way, consider it an opportunity for great joy. For you know that when your faith is tested, your endurance has a chance to grow. So let it grow, for when your endurance is fully developed, you will be perfect and complete, needing nothing. It's easy to become restless in our hearts and minds when we just can't see what is going to birth forth from our waiting. But this I know, Christ has told He won't leave me alone in this labor of life. I don't know what kind of labor pains of life you are experiencing right now, but I can relate to the frustrations that come when I take my eyes off Jesus and look instead at my circumstances. I have prayed for anyone who reads this post. I pray that you would first know the One who has overcome the world and I pray that the Lord would encourage you in a very specific way to remind you that you are not alone. He is Emmanuel---God with us. And would you say a prayer for me, too? Please pray that God would make His will known clearly to us regarding our housing situation, that we would wait joyfully on Him and that we would trust Him for his perfect timing. If you want me to pray more specifically for a need in your life, I will happily add you to my prayer book. Just send me an email letting me know how I can pray for you. I'm excited to see what God does in our lives!